*Corresponding author: Sivasankar Jaya Kumar, Department of pediatric surgery, University Hospitals Leicester NHS trust, Leicester Children’s Hospital, Infirmary road, Leicester, LE1 5WW, UK. Introduction:Historically, the incidence of children diagnosed with acute appendicitis has remained stable for a long time. However recently there are reports of decreasing trends in the incidence of acute appendicitis in children. Has this trend in incidence changed? We aimed to investigate the incidence of histologically confirmed acute appendicitis in children in a cohort of population within England. Materials and methods: Retrospective review of all children aged≤15 years who had emergency appendicectomy at our institution between Jun 2001 and May 2003 (Group 1) and between Jan 2007 and Dec 2008 (Group 2). Epidemiological data was obtained from office of national statistics, UK. For epidemiological analysis, we excluded children aged 15 years. Results: 188 children (104 male, 84 female; mean age 10.4 years) in Group 1; 287 children (167 male, 120 female; mean age 10.58 years) in Group 2 were identified. Histology confirmed 44, 101, 43 (Group 1) and 60, 101, 43(Group 2) normal, inflamed and perforated appendixes. The incidence among boys, girls and overall children aged ≤14 years was 1.17, 1.12 and 1.15 per 1000 (Group 1) and 1.99, 1.32 and 1.67 per 1000 (Group 2) respectively. The incidence had considerably increased among boys (p=0.0003(CI 0.43-0.79)), but not among girls (p=0.326(CI 0.59-1.19)). Only girls aged 1-4 years had higher incidence than boys of similar age (p=0.455 in group 1; p=0.355 in group 2). Acute appendicitis is one of the most common pediatric surgical conditions seen in children. Ever since the first report of appendicectomy by Sir Claudius Amy in 1736 and Shepherd , it has remained a puzzle as why some children are susceptible to appendicitis and others are not. Environmental factors, dietary habits and other factors could have an influence on predisposing certain children to appendicitis. Interestingly, a Canadian study suggested that some cases of appendicitis may be triggered by short-term exposure to air pollution and measures to improve air quality may help to decrease rates of appendicitis . Nevertheless, the exact etiology behind appendicitis still largely remains elusive. Very few epidemiological studies have reported the incidence of acute appendicitis in children in the UK [3,4]. The incidence of children diagnosed with acute appendicitis in England and wales was 3.11 cases per 1000 children aged 14 years and below, between 1963 and 1967 (34,000 children per year with average population of 10,915,000). However this incidence had decreased over time and was noted to be 1.15 cases per 1000 children aged 14 years and below, between 1993 and 1997 (11,500 children per year with average population of 9,990,000). This trend of decline has also been noted elsewhere in New England (USA); a 9.7% reduction in inflamed (non-perforated) appendicitis from 1.0 to 0.94 cases per 1000 children, between 2000 and 2007 . It is clear that there has been a declining trend of cases diagnosed with acute appendicitis in children. 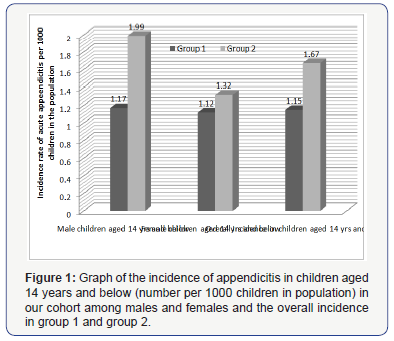 Has this trend in decline of appendicitis incidence in children continued? In Leicestershire, previously Williams et al, showed that the incidence of appendicitis had decreased from 1.84 to 1.17 per 1000 children (0-19 years) over a period of 20 years between 1975 and 1995 However this study reported on children with discharge diagnosis of appendicectomy and not on histological diagnosis of appendicitis, creating a bias by including negative appendicectomy patients as well. We aimed to investigate the incidence of histologically confirmed appendicitis in our cohort of children with the clinical diagnosis of acute appendicitis in our county. A retrospective case note review of all children aged 15 years and less who underwent emergency appendicectomy for suspected appendicitis at our institution between June 2001- May 2003 (Group 1) and January 2007-December 2008 (Group 2) was performed. Patients who had interval appendicectomy and appendicular mass conservatively treated were excluded from the study. Trust clinical governance approval was obtained for this study. A proforma was created and all data collected and incorporated on Microsoft Excel spreadsheet (Version 2002 and 2007©Microsoft Inc). Data was collected on patient demographics, symptoms and signs, operative details, histological findings, complications and outcomes. MedCalc software (Version 13.2.0.0), Social science statistics (http://www.socscistatistics. com) Z test calculator for population proportions, chi-square and parametric tests were used for statistical analysis. Epidemiological data was obtained from the office of national statistics, UK. The catchment population of our institution (Leicester Royal Infirmary) was taken as being that of the Leicestershire County and Rutland Primary Care Trust. Data were obtained individually for the population of children under the age of 15 years (0-14 years) for each mid-year between 2001- 2003 (Group 1) and 2007-2008 (Group 2). Our study included data on children under the age of 16 years (0-15years), but for the epidemiological analysis alone we excluded patients with appendicitis at 15 years of age (n=11 in Group 1 and n =40 in Group 2) and children with normal appendix noted on histology (n=42 in Group 1 and n =55 in Group 2) and thus only actual appendicitis incidence is calculated. A total of 188 children (104 boys, 84 girls) underwent emergency appendicectomy during the study period of 2 years at our institution. The mean age of patients on admission was 10.4 years (2 year+5mths -15years+3mths). A total of 98 patients had laparoscopic appendicectomy and 90 patients had open appendicectomy. There were 44 normal (F18, 26M), 101 inflamed (F47, M54) and 43 perforated (F19, M24) appendix patients confirmed on histology. LOS was 3.66(1-14) days. Complications occurred in 21(11.2%). Re-admissions occurred in 6 patients (3.2%). Re-operation was performed in 3(1.6%) patients. No mortality was noted during the study period. A total of 287 children (167 boys, 120 girls) underwent emergency appendicectomy during the study period of 2 years at our institution. The mean age of patients on admission was 10.58 years (16days- 15years). A total of 58 patients had laparoscopic appendicectomy and 229 patients had open appendicectomy. There were 60 normal, 173 inflamed, 43 perforated appendix patients along with 11 patients with Enterobius vermicularis confirmed on histology. LOS was 3.65(0-27) days. Complications occurred in 36(12.5%) with wound infection noted in 13 patients (4.5%) and post-operative intra-abdominal collections seen in 9 patients (3.1%). Re-admissions occurred in 18(6.3%). Reoperation was performed in 6(2%) patients. No mortality was noted during the study period. The overall incidence among boys and girls aged 14 years or less with acute appendicitis confirmed on histology in group 1 was 1.13 per 1000 children per year and in group 2 was 1.66 per 1000 children per year significantly (p=0.0007). The incidence among boys aged 14 years or less was 1.14 and 1.97 per 1000 male children per year in group 1 and 2 respectively. Similarly the incidence among girls aged 14 years or less was 1.14 and 1.97 per 1000 male children per year in group 1 and 2 respectively and of girls aged 14 years or less was 1.13 per 1000 per year, respectively (Figure 1). The incidence had considerably increased among boys (p=0.0003), but not among girls (p=0.326). The highest increase in incidence of appendicitis from group 1 to group 2 was noted among children aged 10-14yrs: 1.79 to 2.72 per 1000 (p=0.00398); followed by children aged 5-9yrs: 1.2 to 1.74 per 1000 (p=0.04884). However, the increase in incidence of appendicitis noted among children aged 1-4yrs from group 1 to group 2 (0.38 to 0.48 per 1000) was not statistically significant (p=0.5754) and similarly the increase in incidence noted among children aged<1 yr from group 1 to group 2 (0 to 0.13 per 1000) was also statistically insignificant (p=0.337). Our cohort was broken up into four age groups<1 year (n=0), 1-4years (n=14), 5-9 years (n=54) and 10-14 years (109) and the corresponding incidence of appendicitis (confirmed on histology) in each group was calculated separately (Figure 2). In both groups 1&2, the incidence of appendicitis among girls aged 1 -4 years was higher than the males of similar age (p= 0.455 in group 1; p=0.355 in group 2). In rest of the children aged<1, 5-9 and 10-14 years old the incidence of appendicitis was higher among males than females. There was also a marked reduction in the incidence of appendicitis in the teenage females (10-14 years old) in comparison to the males of similar age (Figure 2). 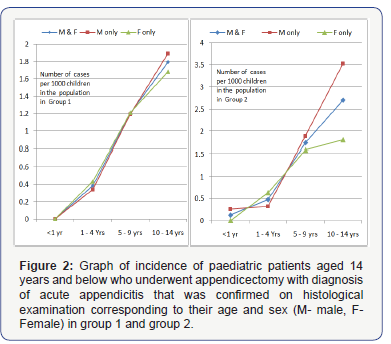 Further breakdown analysis of the cohort into inflamed and perforated appendicitis within different age ranges from both group 1 & 2 are shown in (Figure 3), for comparison. Most studies that have reported on the incidence of appendicitis included adult patients [6-9]. In Finland, the incidence has been reported to decline from 1.45 to 0.98 per 1000 among inhabitants between 1993 and 2007 . Similarly, an American study has shown that the incidence of appendicitis decreased by 14.6% between 1970 and 1984 . However, the largest epidemiological study (n=608116) of appendicitis in recent years, from California (USA) has shown that incidence has increased over time at an average rate of 0.5 cases/100,000 population/year (p<0.001) and is higher in the summer months . Very few studies have examined the incidence of appendicitis in children alone [3-5]. Previously, in Leicestershire county the incidence of appendicectomy was reported to decline from 1.84 in 1975 to 1.17 per 1000 children (aged≤19 years) in 1995 . However, interestingly our data reveals that the incidence of appendicitis in children aged ≤14 years within Leicestershire county has increased from 1.15 to 1.67 per 1000 children, over a period of 6 years between 2002 and 2008. It is possible that the population of children in our county has increased over a period 6 years during the study period and so the increase in incidence of appendicitis. However, analyzing the epidemiological data from the office of National statistics UK revealed that the mid-year population of children aged 14 years and below in our county has reduced from 118174 in 2002 to 114859 in 2008 (Figure 4). The drop in population data is not anecdotal and in fact the population of children aged 14 years and below has continued to decline steadily. This does not explain the increased incidence of appendicitis noted in our study. The catchment area of our institution is taken as that of Leicestershire county and Rutland PCT. Within this catchment area there is only one district general hospital in Loughborough, where emergency surgery in children is not undertaken. It is possible that some of the our catchment population living in the periphery of our county have been treated elsewhere, outside the county by adult general surgeons, due to the close proximity to other hospitals situated in for example: Kettering, Nuneaton, and Derby. We do not have the actual data on children from our county treated for appendicitis at these periphery hospitals and admit this as a limitation in our study. However, emergency general paediatric surgery is still being provided at these hospitals by adult general surgeons and has not changed within our study period. This was shown by a survey conducted by the Royal college of surgeons England (RCSE) in 2010 . Therefore, it is unlikely to have influenced the difference in incidence of appendicitis in children treated within the study period. The cut-off age for children treated by adult general surgeons in district general hospitals has undergone a considerable change since the advent of minimum training requirements in paediatric anaesthesia prior to anaesthetising children at district general hospitals. This is claimed to have increased the elective workload of general paediatric surgery at tertiary centers, however the emergency paediatric general surgery workload at these hospitals has largely remained unchanged. The cut-off age for emergency general paediatric surgery was 1 year or less at most of the hospitals situated outside the periphery of our county as per the survey by RCSE in 2010 . Appendicitis in children under the age of 1 year is very rare and there are very few children aged 1 year or below, diagnosed with acute appendicitis each year. There were only 2 children≤1 years of age in Group 2 and none in Group 1 in our study period. This is unlikely to have produced a significant increase in the emergency workload of acute appendicitis at our centre and does not explain the increased incidence of acute appendicitis noted in our study. Although the survey by RCS England had revealed the cut-off age of the children managed with acute appendicitis in the district general hospitals within Leicestershire to be 1 year and above, we do not have the evidence to support if this practice was strictly adhered to. Nevertheless, the highest increase in incidence of appendicitis from group 1 to group 2 was noted among children aged 10-14 yrs: 1.79 to 2.72 per 1000 (p=0.00398). The increase in incidence of appendicitis among children aged 5 years and below was not statistically insignificant. This does not support the view that the increased incidence of appendicitis noted in our study period was due to increased referral of younger children to our centre in the later study period. In our study we excluded children with appendix mass treated conservatively and those who underwent interval appendicectomy (n= in Group 2, Data unavailable in group 1) within the study period. We do not have the exact number of children diagnosed with appendix mass and conservatively treated. We admit this as another limitation in our study. It is possible that more patients during our first study period (group 1) were treated conservatively than during the later study period (group 2). 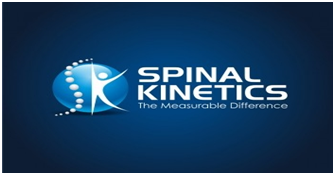 However, our practice has largely remained the same; to examine the patient prior to surgery and if an immobile mass was felt then to not to proceed for surgery. We believe the number of children presenting with an inoperable mass is very few and that our practice has largely remained unchanged, it should not have influenced the actual incidence of appendicitis in children significantly. Acute appendicitis in children still remains as a clinical diagnosis in children in the UK. Elsewhere, in the world, clinical diagnosis has been supplemented with the aid of CT scan and the accuracy in diagnosis of acute appendicitis has approached nearly 97% (Positive predictive value of 96.4% for CT aided vs. 90.8% on history and examination alone) . Diagnostic aid of CT scan has been claimed to have increased the diagnosis of acute appendicitis in children, and minimised the negative appendicectomy rate. However, we believe that diagnostic aids and the negative appendicectomy rate influence the incidence of clinically diagnosed appendicitis patients and not the actual incidence of histologically confirmed appendicitis within the population. In our study for epidemiological analysis, we excluded the negative appendectomy patients and included only children with appendicitis confirmed on histology and thus reflecting the actual appendicitis incidence and not the incidence of appendicectomy. Treating appendicitis with antibiotics is not new and has been practiced in some places as first line of treatment instead of appendicectomy. In a study reported from Sweden, 77% of appendicitis patients treated with antibiotics alone improved while the remaining 23% of patients required appendicectomy later . This study included adult patients and there has been only one recent study with 12 children each in operative and non-operative group that concluded that early acute appendicitis in appropriately selected children can be successfully treated non-operatively with antibiotics . Although in the UK, appendicectomy and not antibiotics is the norm, with these interesting data, it is possible that some children with early appendicitis were treated conservatively with antibiotics as other systemic infections (Eg: Gastroenteritis, Pneumonia), and may have never returned with symptoms. The proportion of such children could have been higher in the initial study period and less during the later period, thus masking the actual appendicitis incidence in children during the initial period. Studies have reported the appendicitis incidence to vary according to dietary habits , hygiene, socioeconomic status , ethnicity , seasonal changes , age and gender. Low fiber intake is thought to be the cause of childhood appendicitis in 70% of the cases. Recurrent abdominal pain, chronic constipation and positive family history of appendectomy were reportedly more frequently in children who had appendectomy (P<0.001) . Barker et al. study on british children reported that, as hygiene and socioeconomic status improved the appendicitis incidence increased within the population . It is possible that the dietary habits of children in our county have changed over the study period and a subsequent increase in appendicitis in children. Multi-variant analysis on estimated 428463 children in nationwide study in America suggested that African-Americans, as compared to Caucasians, were less prone to develop appendicitis (odds ratio (OR)=0.39, 95% CI (0.38, 0.41)) . We do not have data on ethnicity and socio-economic status for our study and are unable to comment on these variables. Our study included data over a period of 2 years in each group and so seasonal changes are unlikely to have influenced the overall incidence of appendicitis in our study. All these factors could have influenced the number of children having appendicitis and thereby reflecting on the variation noted in the incidence within the study period. However, we have found little evidence to identify any confounding variables leading to a false increase in incidence of appendicitis and therefore believe that the increased incidence of appendicitis noted among children in our study is a true reflection of the actual increase in the incidence of appendicitis. Although the sample population of Leicestershire county does not actually reflect the population of England and wales per se, it still represents a part of the country and may provide a clue to a possible increasing trend in the incidence of appendicitis in children in the UK. The highest incidence among children was noted in male children 10-14 years of age in our study (3.5 cases per 1000 in Group 2). This was similarly noted in other studies as well [8,9]. Interestingly, the incidence of appendicitis was noted to be higher in males than females in all but one age range: 1-4years, where the incidence was noted higher among female than male children in both groups 1&2. This we believe has not been observed before. Further breakup confirmed that the incidence was higher among the inflamed (not perforated) appendicitis in the female than male children. The data from groups 1&2 are consistent with similar findings of incidence. Although statistically insignificant (p=0.455 in group 1; p=0.355 in group 2), it represents the characteristics’ of our cohort. It is unclear if such similar patterns of incidence exist elsewhere in the UK or in the world. Further studies’ examining larger population of children is recommended. In conclusion, the overall incidence of appendicitis confirmed on histology in children (aged 14 years and below) has increased over 6 years (p=0.0007) between 2002 and 2008 in our county. The incidence of appendicitis among boys (aged 14 years and less) had considerably increased and was statistically significant (p=0.0003), however, the increased incidence of appendicitis in girls (aged 14 years and less)was not statistically significant (p=0.326). 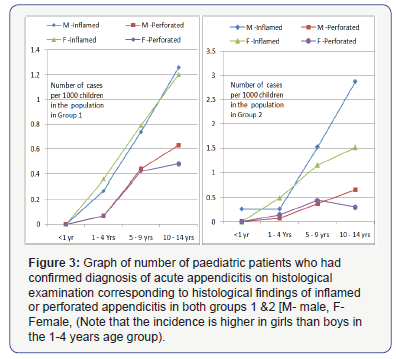 The incidence of inflamed (not perforated) appendicitis was higher among the female than male children aged (1-4) years but in all other aged children, the incidence was higher among male than female children in our study. Mr. Dagash H, Department of Paediatric Surgery, University Hospitals Leicester, Leicester Royal Infirmary, Infirmary Road, Leicester LE1 5WW, UK. Shepherd JA (1954) Acute appendicitis: a historical survey. Lancet 267(6833): 299-302. Kaplan GG, Dixon E, Panaccione R, Fonq A, Chen L, et al. (2009) Effect of ambient air pollution on the incidence of appendicitis. CMAJ 181(9): 591-597. Stringer MD, Pledger G (2003) Childhood appendicitis in the United Kingdom: fifty years of progress. J Pediatr Surg 38(7): 65-69. Williams NM, Jackson D, Everson NW, Johnstone JM (1998) Is the incidence of acute appendicitis really falling? Ann R Coll Surg Engl 80(2): 122-124. Aarabi S, Sidhwa F, Riehle KJ, Chen Q, Mooney DP (2011) Pediatric appendicitis in New England: epidemiology and outcomes. J Pediatr Surg 46(6): 1106-1114. Addiss DG, Shaffer N, Fowler BS, Tauxe RV (1990) The epidemiology of appendicitis and appendectomy in the United States. Am J Epidemiol 132(5): 910-925. Ilves I, Miettinen P, Huovinen P, Karl HH, Jennyl A, et al. (2013) Outpatient Antibiotic Use and the Incidence of Acute Appendicitis in Finland: A Nationwide Study from 1990-2008. Surg Infect (Larchmt)14(4): 352- 356. Lee JH, Park YS, Choi JS (2010) The epidemiology of appendicitis and appendectomy in South Korea: national registry data. J Epidemiol 20(2): 97-105. Anderson JE, Bickler SW, Chang DC, Talamani MA (2012) Examining a common disease with unknown etiology: trends in epidemiology and surgical management of appendicitis in California, 1995-2009. World J Surg 36(12): 2787-2794. The Royal College of Surgeons of England (2010) General Paediatric Surgery: survey of service provision in district general hospitals in England. RCSENG- Professional Standards and Regulation, London, UK. Tsao K, St Peter SD, Valusek PA, Troy L, Scott JK, et al. (2008) Management of Pediatric Acute Appendicitis in the Computed Tomographic Era. Journal of Surgical Research 147(2): 221-224. Hansson J, Körner U, Ludwigs K, Jonsson C, Johnsson E, et al. (2012) Antibiotics as first-line therapy for acute appendicitis: evidence for a change in clinical practice. World J Surg 36(9): 2028-2036. Adamidis D, Roma-Giannikou E, Karamolegou K, Tselalidou E, Constantopoulos A (2000) Fiber intake and childhood appendicitis. Int J Food Sci Nutr 51(3): 153-157. Barker DJ, Osmond C, Golding J, Wadsworth ME (1988) Acute appendicitis and bathrooms in three samples of British children. Br Med J (Clin Res Ed) 296(6627): 956-958.